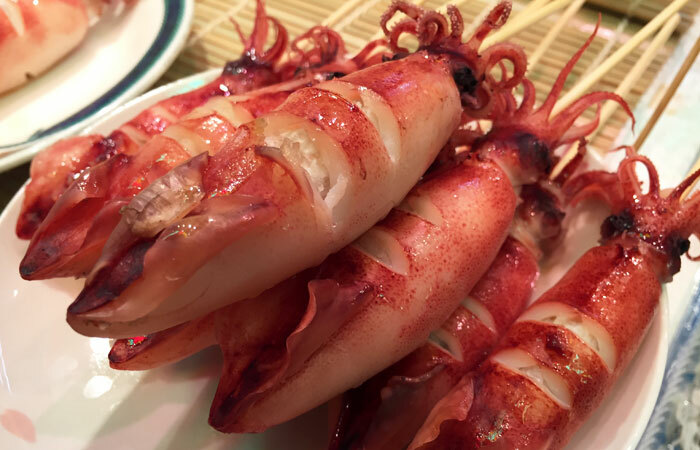 Come hungry and pace yourself: Nishiki Market is a foodie’s haven. Half of this Kyoto street market is composed of shops, while the other half features food vendors selling everything from fish skewers and matcha-dusted mochi on a stick to kushikatsu and fresh uni. I couldn’t bring myself to actually buy one, but I saw tons of locals and tourists walking around with these squid and octopus skewers. 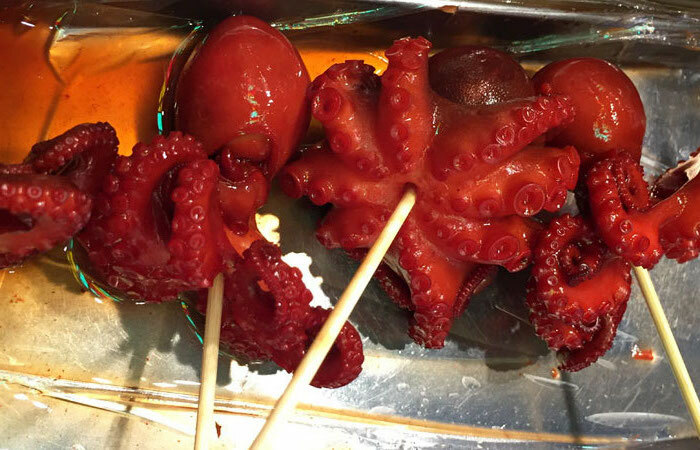 Don’t get me wrong, I love tako, but I get squeamish when I see all those tentacles. I suggest walking through the food vendor side once to scope out the selection — and on your second go-round, start sampling. It’s important to go in with a game plan, ‘cause you’ll probably want to try everything in sight. Matcha lovers, this one’s for you. 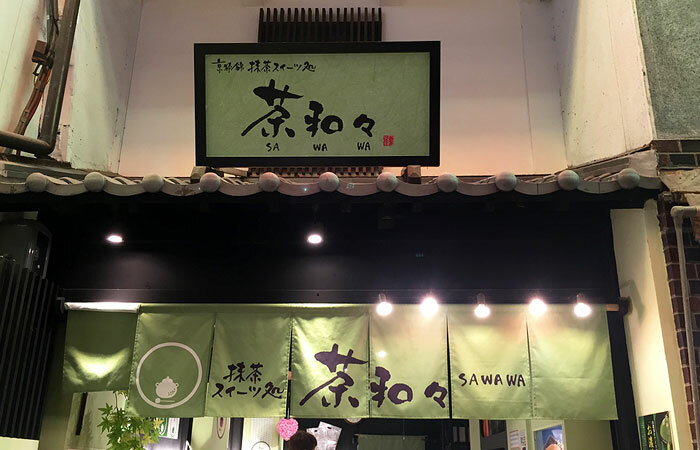 Although Sawawa is a small shop, it’s easily recognizable because of the towers of mochi cubes by the entrance. Kyoto is known for its green tea, so you know this is the real deal. Sawawa’s entrance. 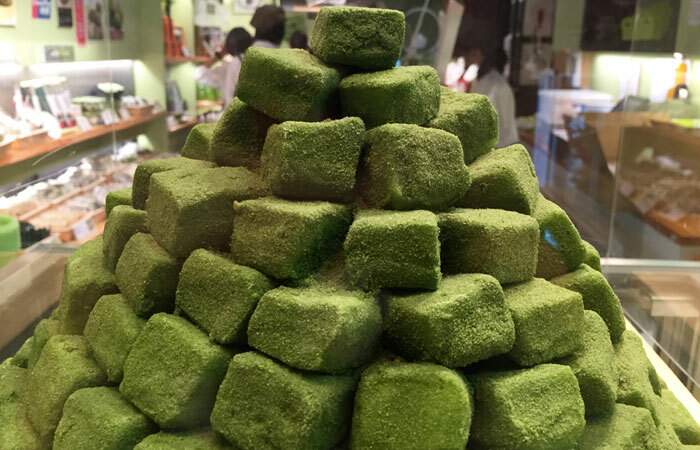 The small store can get crowded, but the warabimochi and other matcha treats are worth the claustrophobia. Sawawa is home to smorgasbord of matcha creations, ranging from matcha pudding and soft serve to soft, jiggly warabimochi. The warabimochi was probably the best I’ve ever tasted. Up until this point, the cubes from Nana’s Green Tea at Waikiki Yokocho were my favorite. The warabimochi just melted in my mouth. Each little container came with eight pieces. 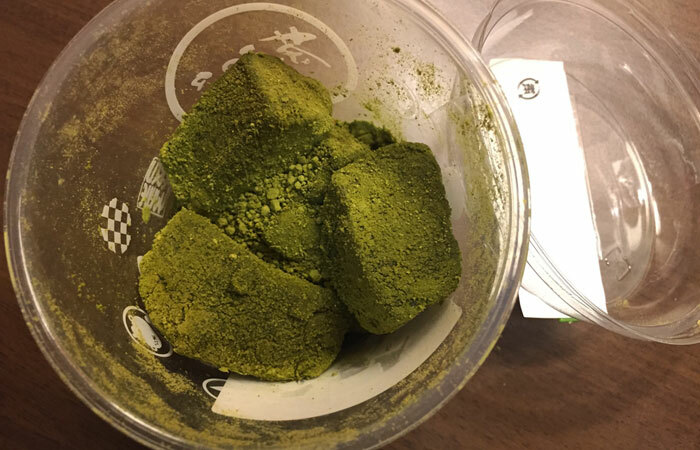 Words were almost inadequate to describe this warabimochi’s freshness, perfectly chewy texture and remarkable matcha flavor. Each cube melted in my mouth and glided off my tongue and down my throat. If the fresh warabimochi lasted for longer than three days, I would have brought a stash home. There were many vendors selling soft serve throughout Nishiki, but I was holding out to find the most aesthetically pleasing one. Once I set foot in this Snoopy-themed store — and saw the soft serve counter — I knew the wait was worth it. 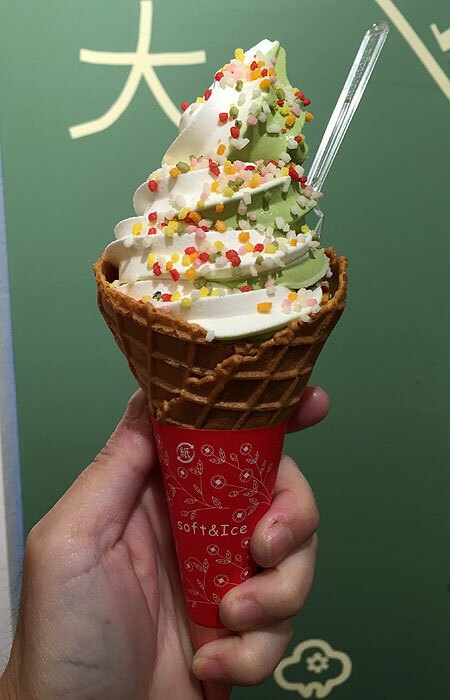 This milk soft serve comes with a matcha cracker bearing Snoopy’s silhouette. Milk is the most popular featured flavor; others included carrot and banana. 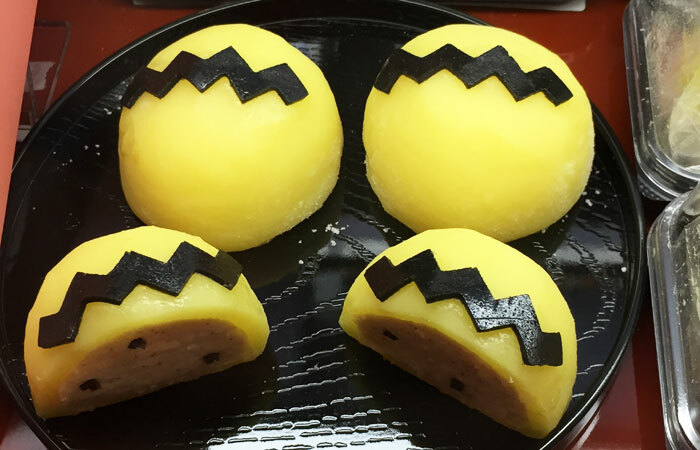 The adorable Charlie Brown treat had a mochi-like filling. I didn’t know what the filling was when I bought this, but it looked so tasty that I just had to try it. I devoured poor Charlie Brown right after I finished my soft serve. I loved the strong cookies ‘n cream mochi filling — it reminded me of my favorite ice cream flavor, but without the melted mess. 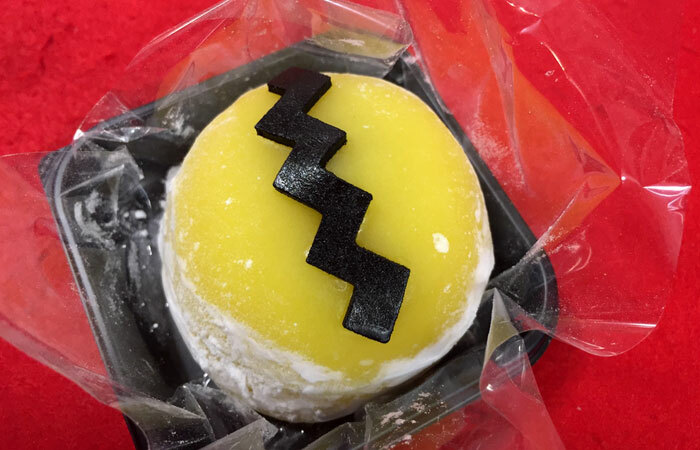 Cross-section of the Charlie Brown mochi treat. Another popular treats here is the Snoopy-shaped manju. Lots of people were buying these but I passed, since I’m not a huge fan of azuki red beans. 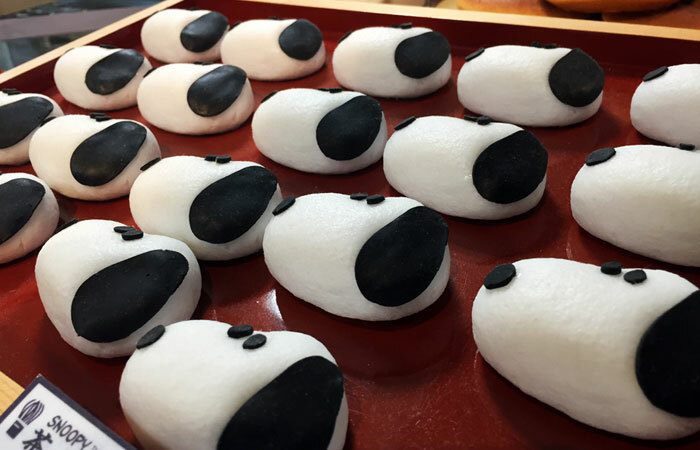 Snoopy Cha-ya’s most popular treat is this Snoopy-shaped manju. Fillings include sweet beans, a peanut paste and matcha bean jam. I love chocolate, but I never had it deep-fried. 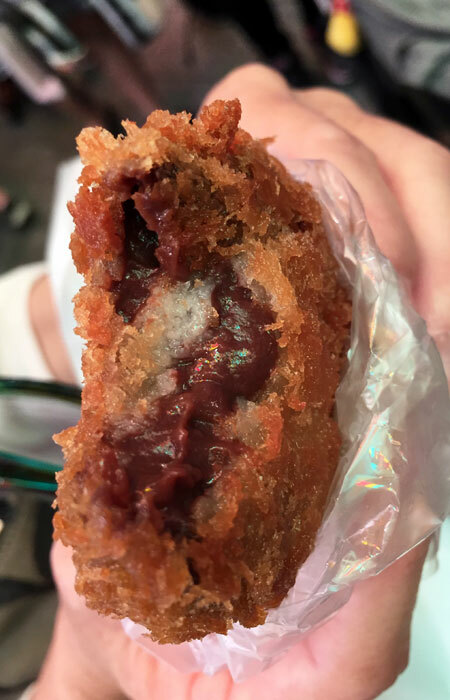 I first heard of these fried chocolate fritters on an episode of “Ultimate Japan.” When I saw a horde of schoolchildren holding these treats at Nishiki, I headed in the general direction they came from. Chocolate meets ebi (shrimp) fry batter. 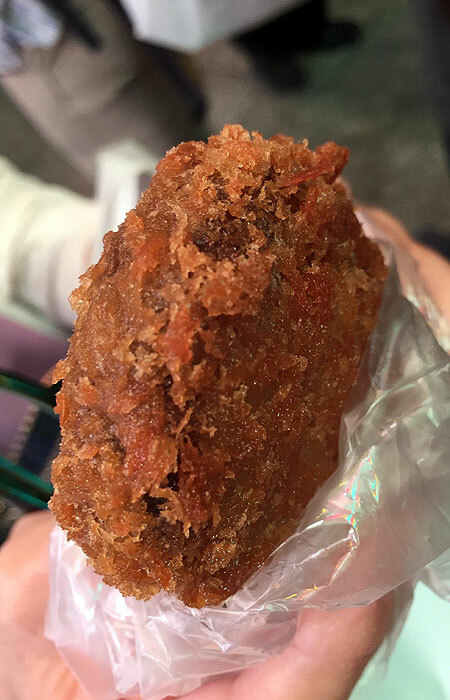 All this sultry, fried goodness for just ¥120, just over $1. The oozing chocolate interior was rich, but the savory, crunchy batter kept things in balance. This was an explosion of oily and sinfully sweet contradictory flavors and textures. Would I get it again? Absolutely. Because we were walking so much, one soft serve was simply not enough. The sheer number of vendors selling these treats was beyond what I could bear … and since it was warm, it made perfect sense to try one from a different vendor. 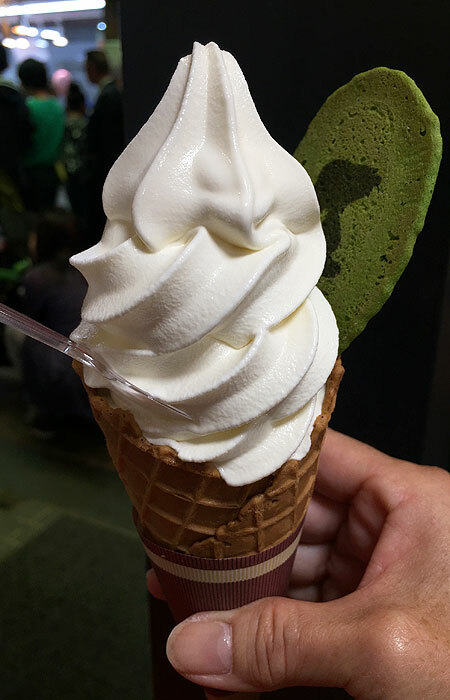 This vendor only had three soft serve flavors — green tea, milk or swirl. Sometimes, simple is best. Since I already had a milk-flavored ice cream, I chose the swirl. I was pleased with the aesthetics and balance of flavors — the sweeter, creamy milk flavor was the perfect counterpoint to the slightly bitter matcha. Plus, the swirl was the most popular of the three options. If we weren’t headed to dinner in a few hours, I would have continued eating my way thrrough the market. You just never know what you’re going to find at Nishiki.